Scarecrows are ancient garden devices, and still used around the world to scare birds away from the garden or farm. Farmers have used scarecrows for over 3,000 years. Scarecrows have been made in many different ways. 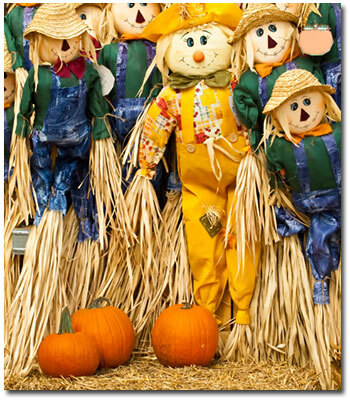 The first scarecrows in recorded history were made by Egyptians and they were made with wooden frames and nets. Greeks and Romans made carved wooden scarecrows. Over the centuries scarecrows ranged from sticks, carved wood, live beings (known as bird scarers), stuffed sacks with hay, to just about anything now-a-days. Scarecrows are not just for scaring away crows anymore. You can dress them up in formal attire or make them as cooky as you can think of! Scarecrow contests and traditions have since followed and the use of scarecrows as Halloween decorations and landscape ornaments are the norm these days. Why not make your own scarecrow? This is a great project to do with the kids. You can buy ready made scarecrows or make your own out of just about anything you can think of. Do you have old pillow cases, garden supplies or house-hold items you can recycle? Lets get to work. This list will give you an idea of things that will work to build your scarecrow. We used PVC to build most of the scarecrow pictured here. Be as creative as you like and have fun with this project. There is no wrong way to make your scarecrow! Here are some simple instructions to follow. Remember you can use any materials you like, this is just a guide. Cut a 10-foot bamboo pole, stick or PVC into two pieces. One 4 feet and the other 6 feet long. Place the 4 foot section across the 6 foot piece about 1 foot down from the top. Use wire, twist ties or tape to tie the two pieces together. Place an old shirt on the short cross piece of the frame and button the shirt in front. Stuff the shirt loosely with straw or shredded newspaper. Place gloves at the end of what should be the arms and secure them with rubber bands. Pull one leg of the pants onto the long pole while the other hangs freely. Tuck the stuffed shirt into the top of the pants. Secure the waist of the pants to the pole with rope or a belt. Stuff the pants with straw, leaves, newspaper or old clothes. Now your going to make the head of your scarecrow. Use an old pillowcase or burlap sack and stuff with hay or newspaper. Tie the opening of the pillow case onto the top of the long stake with a rope. Draw a face with felt pens. Use glue to attached buttons for eyes and yard for a mouth. Stick the scarecrow into the ground or mount to another location. Dress up your scarecrow as you wish. Add a hat, tux, overalls, or dress. Use some old shoes to make it look as though your scarecrow is wearing shoes. Place a garden trowel or other device as if your scarecrow is holding something. 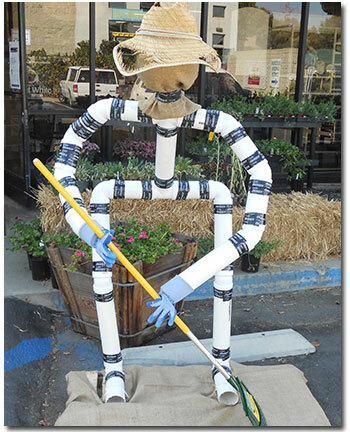 Have fun with this project and remember, there isn’t a wrong way to make a scarecrow! Our Fallbook team made one out of mostly PVC!